Diane SagnierTame Impala’s second album Lonerism topped more than a few 2012 year-end lists, and while it doesn’t do much for me – despite on paper being exactly the sort of thing I should like – if you were to say that Kevin Parker was behind one of the year’s finest psychedelic pop records, I would be inclined to agree with you. Except that I would be talking about Melody’s Echo Chamber. 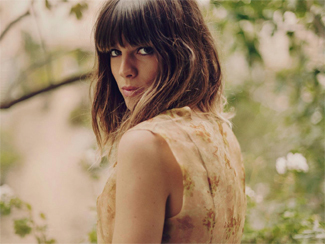 Describing Melody’s Echo Chamber as the sound of Broadcast’s first album being played at volume in a Parisian apartment with the reverberations captured by a vintage ’60s microphone and run through Kevin Parker’s pedalboard might sound like hyperbolic metaphor, but it could also be a literal account of how the record was made. With words – a combination of French, English, and a made-up language called “Melodese” – voice – a combination of sweet girlishness and continental sophistication – and songs provided by Parisian Melody Prochet, both Prochet and Parker contributing instrumentation, and Parker assuming production and mixing roles, the record is a shining, staticy, psychedelic swirl that sounds indelibly retro yet thoroughly modern at the same time. Those who’ve found love in Lonerism‘s otherworldly textures should find Melody’s Echo Chamber a worthy companion piece and those who found Parker’s opus unsatisfying – that’s my hand in the air, there – shouldn’t discount it as more of the same because it’s different enough to stand on its own, and Prochet’s voice should be able to convince even the most skeptical. I’m sorry I missed her live Toronto debut last Fall when they opened up for The Raveonettes, but am hopeful that they’ll be here again this year – perhaps opening up for Tame Impala’s Spring tour? It would just kind of make sense. Drowned In Sound, The Line Of Best Fit and Under The Radar both have extensive feature pieces on Prochet and the creative process behind Melody’s Echo Chamber. Bowlegs also has an interview. The first video from the new Nick Cave & The Bad Seeds album Push The Sky Away, out February 19. Know what’s odd? I still can’t figure out who’s releasing this in North America. I do know that they’re at Massey Hall on March 23, though, so there’s that. A new song from Shugo Tokumaru’s new album In Focus? is available to stream. It’s out February 22. A new track from the forthcoming Shout Out Louds album Optica has debuted to stream over at The Line Of Best Fit. The album is out February 26 and they play The Opera House on May 14. What happens when you give Jens Lekman’s keyboard player a ride from New York to Boston post-Hurricane Sandy so he can catch up with the rest of the band on tour? He writes you a song. And shares it with the world. Congratulations, Olivia and Maddy, you have eleven minutes and eighteen seconds of fame left. Wears The Trousers and MXDWN talk to Victoria Bergsman of Taken By Trees. The Village Voice interviews Malin Dahlström of Niki & The Dove; they’re in town at Wrongbar on January 16. NPR is streaming the whole of Somewhere Else, the debut from Denmark’s Søen Løkke Juul as Indians. The album is out January 29 and they play The Drake on March 4. Iceage have offered a song from their new album You’re Nothing, out on February 19. They also announced a North American tour but while there’s no Toronto date at the moment, that four-day gap between Pittsburgh and Vermont is a bit conspicuous. Just saying. @fyang End-of-the-year surprise for me that album. Kind of knew about it, bought it on a whim, ended up really enjoying it. Amazon.ca says “Sony Music Canada” for the Bad Seeds album.